Remove build_count, replace with instance_uid. Change ARCHEYTPE_HRID.commit_number to build_count. Build_count reset to 1 on each version change. Adjust diagrams and explanations. This specification is in the TRIAL state. The development version of this document can be found at https://specifications.openehr.org/releases/AM/Release-2.0.6/Identification.html. The basis for identifying source (i.e. authored) artefacts is to define a number of separate logically identifying properties, as well as a machine identifier. One or more human-readable identifier(s) can be generated from the non-uid identifying properties. 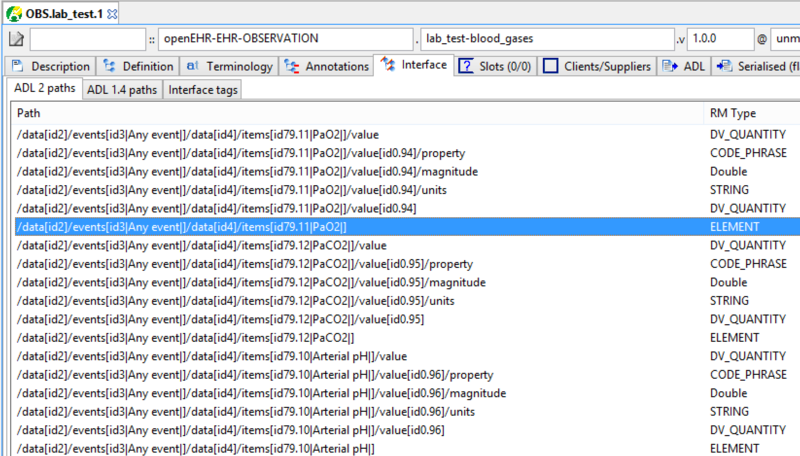 For archetypes and templates, the relevant properties are defined on the ARCHETYPE_HRID class from the openEHR Archetype Object Model. Related properties are inherited from the AUTHORED_RESOURCE classe into ARCHETYPE are shown, including the lifecycle_state property, as well as all other descriptive meta-data. 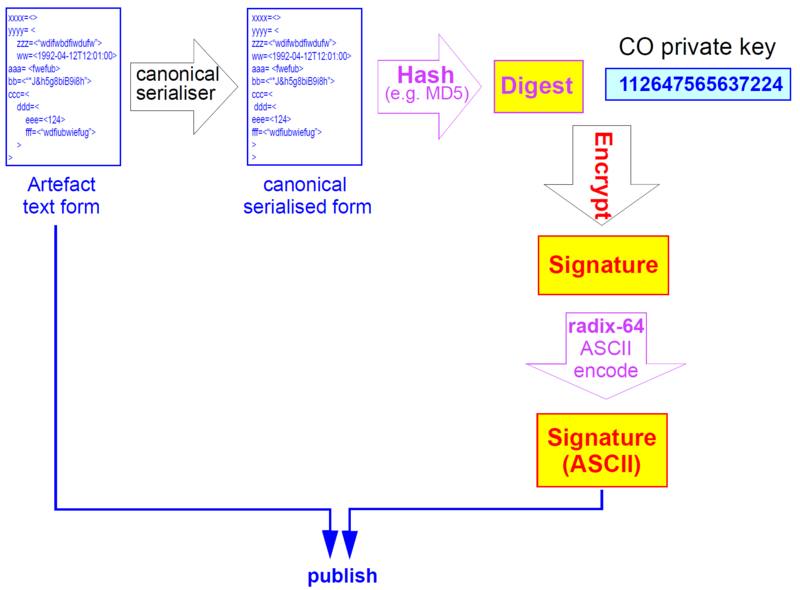 description.lifecycle_state, expressing the development state of the artefact, and used to derive the 'rc' (release candidate) and 'unstable' (development) parts of non-release version ids. Functions such as interface_id, physical_id and version_id are defined to return respectively the 'interface' and 'physical' archetype HRIDs (described below) as strings, and the full version string (computed from release_version , build_count and description.lifecycle_state ). The functions major_version , minor_version and patch_version extract the various parts of the 3-part release_version property. Despite the above differences, the numbering of versions of knowledge artefacts follows the rules for identifying software releases described by [semver.org]. 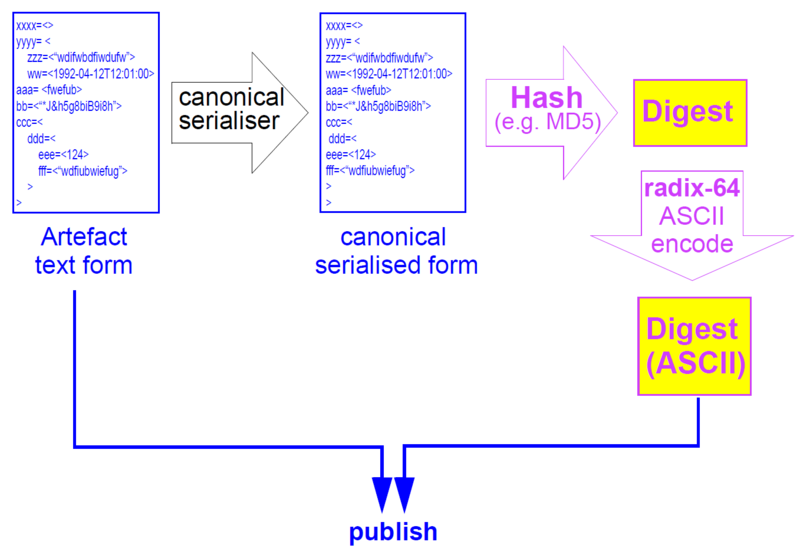 Two 'variant' versions are defined in the above syntax: 'release candidate' and 'alpha'. The first is a standard software classification, syntactically indicated with the tag rc. Version numbers including rc are always of the form M.N.P-rc.B, e.g. 1.3.5-rc.1, where the minus sign (-) is understood as indicating a version that is 'less than' the target version 1.3.5, i.e. 1.3.5-rc.1 is an interim version leading to the stable version 1.3.5. The other variant is indicated with the modifier -alpha, where - indicates a version 'before' the version identified by the preceding numeric identifier, and alpha indicates an 'alpha' development version. 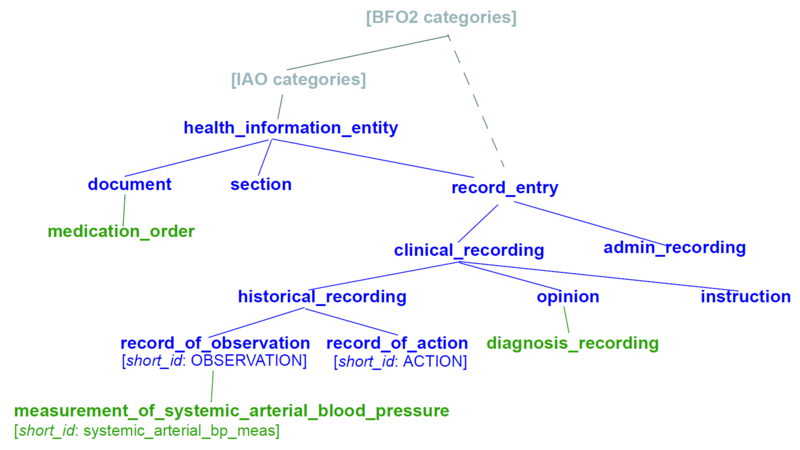 The magnitude of the differences a -alpha version are indicated by the difference between the 3-part version identifiers of the current artefact and the previously published one on which it is based. Note that only the major version forms part of the source artefact human-readable identifier. The intention of that is that a breaking change causes a new artefact from the point of view of deployment. This is analagous to breaking changes in software interfaces, web service defintions etc, being seen as a distinct entity, typically deployed alongside the old version. 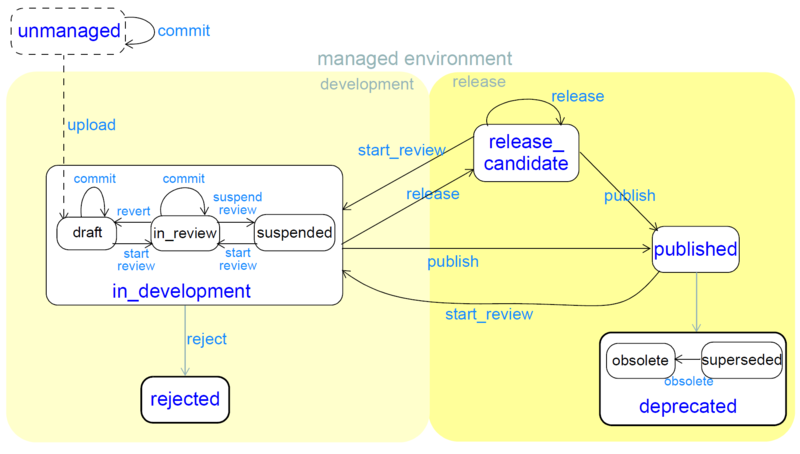 As a consequence of the 3-part [semver.org] version identification scheme, three levels of change to an artefact can be distinguished. The main question for archetype authors and tool developers is: what level of version change is required for a given kind of concrete change to the artefact? Is this change a patch, a minor version or a breaking change (i.e. major version)? This has the important side-effect that minor versions of a given major version may have additional semantics comared to the original major version (i.e, minor version 0) and any other intervening minor version. In other words, specifying a major version in general may not be sufficient to designate all of the interface available in the latest minor version. Therefore, for purposes of referencing an artefact with the expectation that the reference will designate specific elements, at least a minor version may be needed. This is discussed further in the Referencing section. A multi-level model is used, where some states have 'micro-states', and top-level states are known as 'macro-states'. The intention is to provide standard names for all macro-states, while suggesting and allowing micro-states where they make sense. Macro-state names are the basis for software version identification - 'development' corresponds to the -unstable variant, release_candidate to the -rc variant. Micro-states are useful to indicate because they define names for finer-grain states typically supported in artefact repositories. An artefact normally starts life at 0.0.1, although it is acceptable practice to start at some other v0 version e.g. 0.5.0 to indicate approximately how mature the artefact is. It remains as a v0 version for a period of unstable early development leading to an initial releasable 1.x version. At some point, the artefact will be uploaded to a managed repository, at which point its identifier will be prepended with the management organisation namespace (and may change in other ways). An artefact may be rejected, in which case its minor version is incremented (following the [semver.org] rules), and the artefact lifecycle state is set to rejected. At some point, the authoring team of an artefact will decide the artefact is ready for release. Its release version id is then calculated as a function of the difference between the current form and the base version on which it is based. An artefact may eventually be deprecated, in which case its minor version is incremented (following the [semver.org] rules), and the artefact lifecycle state is set to 'deprecated'. It may be classified inside the repository registry as obsolete, suspended or in some other way. 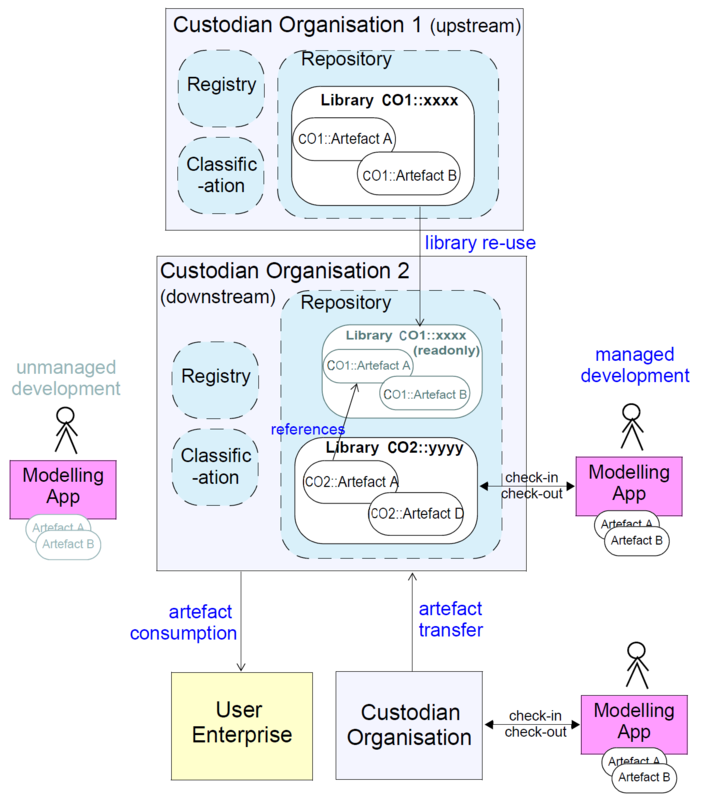 This section deals with how knowledge artefact identifiers are managed in the distributed environment illustrated in the Distributed Development Environment figure. Rules are needed to define how identifiers are managed in the event of an artefact coming under management, as well as transfers and forking of managed artefacts. 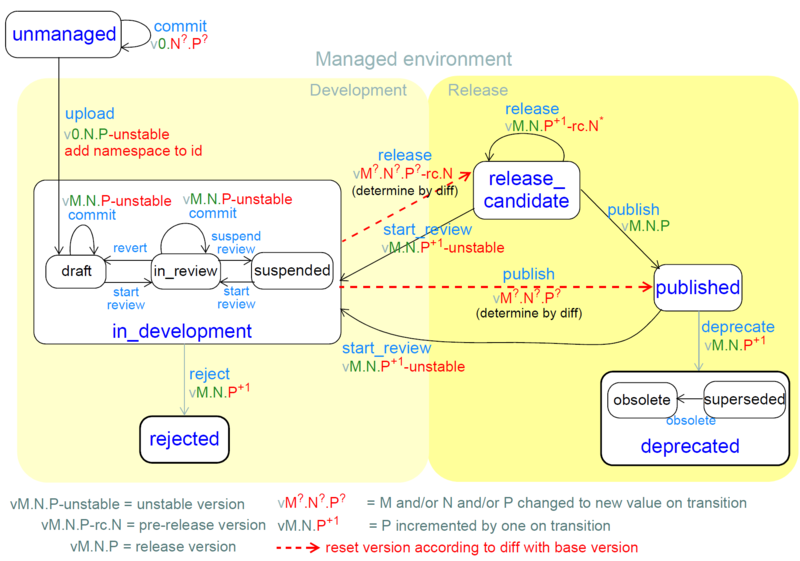 When an artefact is first created, its lifecycle state is 'unmanaged' and its version identifier is v0.N.P, i.e. a 'pre- v1' version, generally recognised (e.g. by the Github Semantic Versioning guidelines ([sem_ver]) as being an unstable form of the artefact that makes no promises with respect to the normal major/minor/patch versioning rules. The artefact may be given a Guid by tooling, although this will be ignored by a management organisation due to the fact that Guids assigned by ad hoc tools or direct human authoring are often copies of existing Guids (due to cut and paste) or are unreliable in some other way (improper Guid algorithm implementation).